Back in the heyday of tourism sites, haunted houses were a thing -- but only for October. Thankfully, though, we're seeing that upsurge of horror enveloping the year-round masses thanks to the latest announcement that Universal Studios theme park will feature their "Halloween Horror Nights," plus a ride dedicated to one icon of horror media you might recognize: FX's American Horror Story. Now, of course, we're wondering if Universal's going to carry this one beyond the season (DO IT), but what you have to realize is that the country's much more founded and grounded on the horror rides even beyond that of your traditional carnival and some of the more eerie establishments (haunted maze, hall of mirrors, yadda yadda). 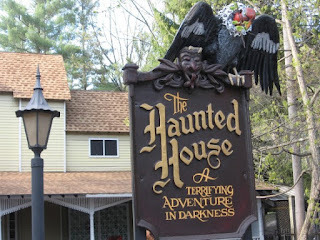 Seriously.... People love getting scared on a ride without throwing up (at least not due to demonic possession). And there are five of them. Rest assured: there are more, plus all of the major haunted houses just about every city will put out during the Halloween season, but understand this: some of these attractions are, in fact, all spring, summer and autumn, and they're not defined by a certain spooky holiday. Nostalgic. 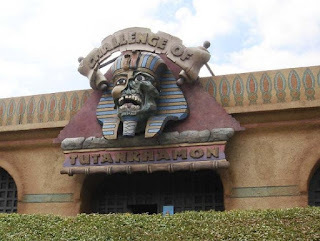 That's all I can say about this dark ride steeped in history, having debuted back in 1973 (and it's still running even today). You've got it all here, but it's not necessarily a big-time haunted house with the long lines and a warehouse to house all the actors and sets. No, a lot of the visual and sound effects for this were created in-house along with all sorts of found objects and donated materials. The end result is a nifty trip through a dungeon, a wizard's library and a haunted kitchen. The ride would both freak you and please you as a family experience. Even more nostalgia, and we're lovin' it. Looking like a true carnival ride, in fact, you're getting some real animatronics with this doozie, plus a phantom piano player having frightened quite a few riders over the years. To this day, the ride's continually getting new additions, too, based on the trends. Graphic electrocutions have been added in, plus one renovation back in 2013 after its 58th birthday (yes, that long). Now this is what I'm talking about -- a ride not really defined by Halloween, so you're going to see this sucker for a good portion of the year. 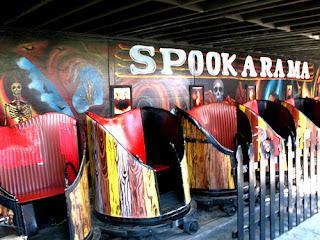 It was originally released in 1935 for the Philadelphia Toboggan Company as the last "walk-through" type ride of its kind designed to be sort of like that "hall of mirrors," only with a pirate, buried treasure, and Indiana Jones type adventure sprinkled in. Pretty fun. Dark. And a bit scary at times. That's what we love. The beautiful thing about this ride is the fact that it's also an interactive game -- like laser tag. In fact, it very much is like laser tag involving teams where you have to beat the "Lord of Destruction and Chaos" throughout the entire ride. Instead of it being just an arena of sorts, it's an actual adventure, leading you through experiences designed to jolt you and keep you on your toes -- but with your very own laser weapon! Cool.... And this beast of a ride debuted in 2003, still kicking with its 130 targets (tomb-protecting demons, apparently). 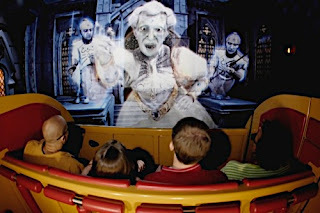 Lastly, this latest endeavor of 2005 utilized some of the most cutting-edge technololgy, built-in motion sensors with 3D video projection and also other traditional special effects for one truly rich experience that will scare the eyeballs our of your sockets. And it's a long experience, too: a pre-show, plus nine different scenes to go through in a 40K-square-foot building. That's something standing out, because the Curse of DarKastle is an actual storyline you actually get to experience as you go through the entire ride. You're, in essence, not just watching all these scenes, disconnected from each other; you're experiencing the story behind the entire thing, and it's blood-curdling-ly lovely.